The Soil we produce here at BS Ranch and Farm is a natural premium quality Soil, which can be used as a soil amendment, soil enhancement, potting soil or top soil. BS Ranch and Farm accepts a variety of organic materials that help the natural composting processes to occur. Let’s take a quick look into the soil process! The soil mixture that is currently being finished and sold is a Premium Humus Soil/Soil Enhancement product. 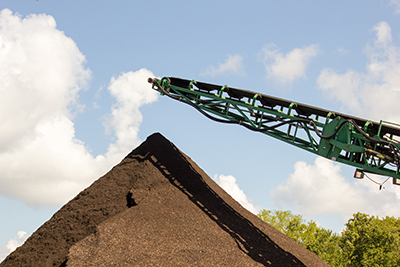 After intake, all of the wood/yard debris materials are then shredded and ground to a mulch, next the mulch is mixed with pre-consumer fruit and vegetable products. In our state of the art facility it is set to decompose in as natural a state as possible. Our process helps to create a healthy and natural Microbial activity. This process takes anywhere from 12 to 24 months. At this time, the product is screened to a 1/2 inch or less particle size for easier handling and techniques. It is then tested for quality and made available for sale. All of our organic materials are taken in, processed and stored safely and within all local state and national guidelines. All of our products are tested monthly and are completely playground and pet safe! This is a product that is a natural soil fertilizer, has a life expectancy of a minimum of 5 years and because of the longer and more natural processing it is the best around! Come try it for yourself! Please reach out to us if you have any additional questions, BS Ranch and Farm always welcomes feedback and will gladly assist you in any way possible.